Could somebody to find the root of this problem? Could it be related to UEFI? It's the first time I installed Arch Linux on a computer with UEFI. Mod Edit - Replaced oversized image with link. Although not related to your issue your ~/.xinitrc is incomplete. Please read the startx wiki page to find out what needs adding. Have you tried removing OMZ? It's a hideously buggy collection of code that usually causes more problems than it solves. But nothing helped and my prompt still looks messy. Nothing helped with what? You gave some useful background about your system, but you've not described a problem other than what is in your title. You've not shown us any configs with a custom prompt. If you are actually using oh-my-zsh, then that is likely the problem. Disable and/or uninstall it. Does the problem persist? Thanks for the help, I still have some problems with characters. I created a new .zshrc. Some of the characters are still not being displayed. Is it because DejaVu doesn't support those characters? I also installed otf-inconsolata-powerline-git and changed my .Xdefaults. Thanks, I thought about this and I'm using it in my current config. But it's a bummer using this workaround and not actually fixing the problem. I liked Oh my ZSH and never had a problem with it on my system at home. Sorry for the oversized images. I keep forgetting it when I'm coming here because it's kinda unusual. What makes you believe this is a "workaround"? 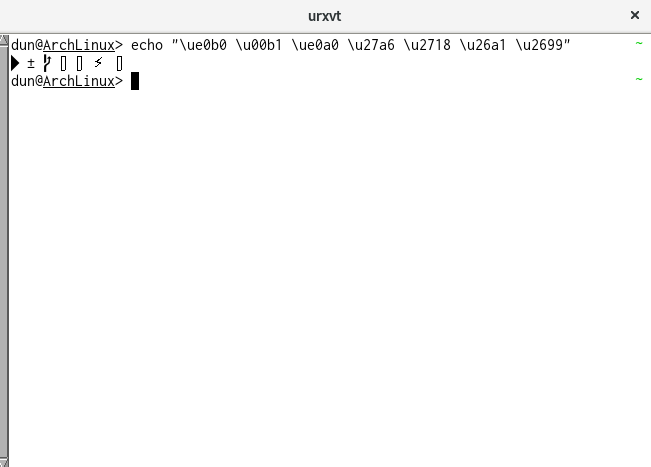 This is how the glyph substitution in urxvt works - you define the fonts and order to pick from. Since most obviously none of your fonts do not provide all required glyphs, this is exactly the proper solution. Also this has absolutely nothing to do with OMZ which is complete FUBAR one multiple different levels. It makes me believe that because all I did back then was downloading Oh my ZSH and a configured .Xdefaults with Solarized. It's still working perfectly on my system at home. I only had a single font in my .Xdefaults and I still don't understand why it's not working on this system. Because the font you used provided all the glyphs you used. 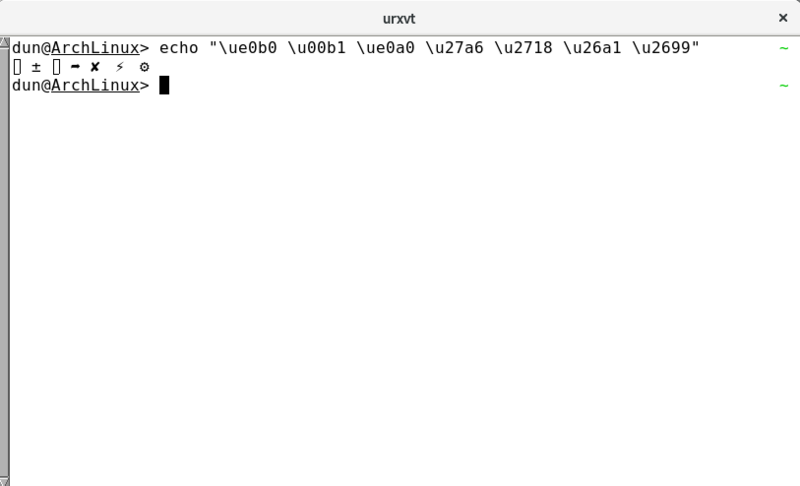 Or: you're not actually using urxvt on the other system but eg. some VTE3 based VTE which will try down the fontconfig substitution list. Whatever the difference actually is (font or PS1) only you can figure by comparing the system. You were right. It was all because I used Inconsolata. I just never noticed the lack of some characters on my system at home. I'm giving Prezto a try because I only could find a sh file for a standalone Agnoster theme and couldn't get it to work. In the description it said I had to source the sh file but my prompt only displayed $(build_prompt$? ).